I love it when I have an opportunity to plan a dinner party. Choosing each course and beverages, deciding on a dessert, and figuring out how much can be prepared in advance is a fun challenge. Last week, friends who now live in Dublin were in Austin for a visit, and we were excited to invite them for dinner one evening. When your dinner guests happen to do a lot of traveling and happen to know food, it makes menu planning a little more stressful, but I knew we’d have a fun time regardless of the meal. Since I’ve been so interested in The New Spanish Table lately, I chose several things from that book for our menu. 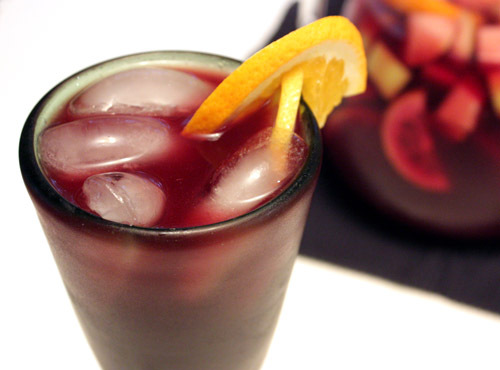 First was a sangria made with tempranillo, brandy, and my favorite liqueur Paula’s Texas Orange. Along with tapas of olives, nuts, and Spanish cheeses, I wanted to serve something a little different which was an idea that actually came from the dessert chapter in the book. There is a suggestion to use a blood orange and campari granita with shrimp or scallops, and I was intrigued. There’s a small amount of sugar in the granita, but the blood orange juice and campari made it more tart and fruity than sweet. The idea of a frozen, brightly colored topping on a scallop was something I had to try. Making the granita was straightforward. I juiced some blood oranges after zesting one of them. The juice and zest were added to one quarter cup of sugar in a saucepan, and the mixture was warmed until the sugar dissolved. It was left to reduce for a few minutes, and then allowed to cool. Once cool, about one-third cup of campari was added. Freezing a granita is easiest in a wide, shallow pie dish. The juice mixture was poured into the dish and placed in the freezer for about an hour before being stirred and scraped. Then, every 30 minutes for the next couple of hours it was scraped and flaked. It takes a little longer to freeze a mixture with alcohol in it, but soon enough it became grainy and icy as it should. Then, I seared large sea scallops and allowed them to cool to room temperature so that the granita topping wouldn’t melt instantly. I topped each scallop with a little scoop of granita and some chopped cilantro. The bitterness of blood orange and campari balanced the sweetness well and mingled nicely with the mild flavor of scallops. Next time, I might sear the scallops earlier and even chill them a bit before topping them with granita since it did melt more quickly than I would have liked. 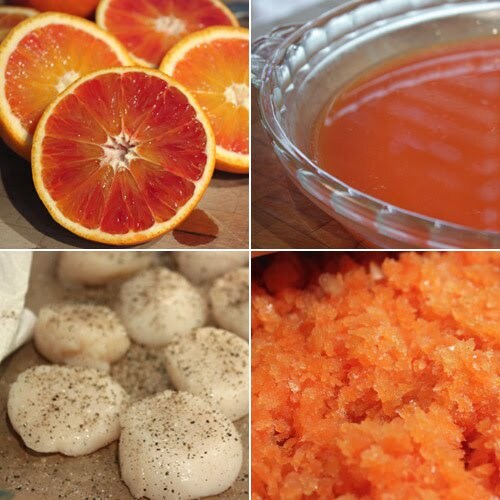 The bright orange color of the frozen granules was as pretty as can be, and it was a fun play on sweet and savory expectations. There was more to come after the tapas, and I’ll show the rest of the meal in upcoming posts. Because there are so many restaurants in Austin we wanted to eat at during our visit we made a decision to not accept invitations to people's houses. Sometimes you just have to be ruthless. Everyone's house but one: Lisa's. What a fun and delicious night. Thanks Lisa! Wowza. I would come to dinner at your house any time! i love the idea of this dish and your photos are just beautiful. One of my favorite cocktails is Campari and I think that next time I make drinks I will try Campari and blood orange. Reminds me of Sicily. Beautiful scallops. I've only made seared scallops once. I've been craving for them a lot lately. Yum!!! wow, they look so good! That is a very interesting recipe and combination! Wow, you are very creative! i'm not sure which i find to be more lovely--the hue of the drink is gorgeous and the little scallops couldn't look more perfect. you're a star, lisa! I love that granite idea - with or without the scallops it sounds great. These are stunning! I'm trying to imagine the flavors together but I think this requires a direct tasting. While I have no problem with nearly all other techniques of cooking seafood, searing scallops as perfectly as you've done here has so far eluded me. Your dish comes together beautifully! You've done a marvelous job convincing me that I need to get my hands on The New Spanish Table . . . ! Be still my heart! I can't wait to try this on the hubby... He adores scallops! Very cool! I love the idea of this granita on top of the scallops, excellent! I love this combination Lisa! The color is lovely...what a terrific presentation and I would love those flavors! We eat scallops quite a bit so I'm going to try this soon. Granitas are so simple to make, aren't they? I love them. Oh boy, you just know these are going to be good, the sweetness of the scallops offset by the blood orange Campari granita - what a delicious combo. What a pretty appetizer Lisa. Very modern dish indeed. I was wondering how the frozen granita wouldn't instantly melt when put on the scallops. But scallops at room temp are just as yummy. Great pics! Don't you stress out girl! You did a fabulous job and I am sure they were super impressed! Love the photo and the idea! Amazing as always. :) I am hoping I can get some blood oranges toward fall so I can try to replicate this. I love the look of a seared (really well as yours) scallops, and the whole flavor profile here, well if they did not want to leave, could you blame them- mission accomplished on making a statement for foodies! The textures and flavors must be so very contrasting. Awesome dish as always, Lisa!! Georgous, tasty & apart too! Awesome! Love the idea of the granita over scallops, I wonder if it would work well over oysters too, maybe a lemon granita? Sally: Oysters are a great idea! that granita looks so pretty and refreshing! WOW!!!! What gorgeous pictures and a delicious and unique dish!!! Stunning! I would love an invite to your house for dinner!!! LOL Lucky guests! 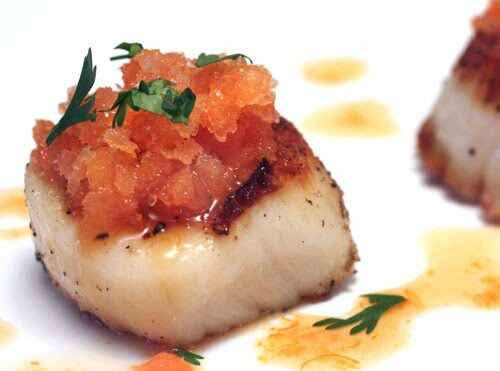 I love hot and cold in one dish, and I can almost taste the sweet blood orange on that beautifully seared scallop. Gorgeous photos too! I want this NOW! (And the sangria too). Thanks for the inspiring post! Great job, Lisa. 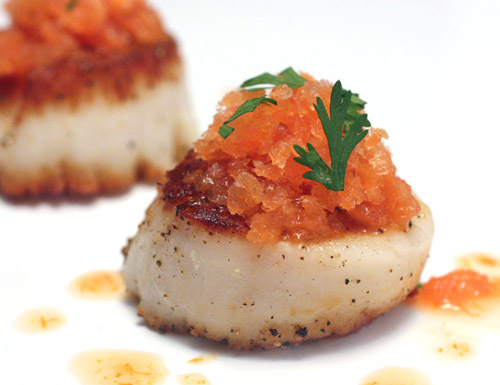 I loooove scallops, and these look absolutely amazing. Thanks!